It’s been two lovely years with Vim and I’m sold! Vim’s the straight edge razor that slices through code. It’s like having a finely crafted and personalized lightsaber. This post is aimed at getting a new Vim user up to speed without cutting off or wanting to sever their hands. I’ll assume that readers of my blog can install GVim or MacVim on their own. On OSX it’s as simple as using homebrew. On Linux, use the awesome package manager of your choice. The first thing to learn is a lesson from Douglas Adams: “Don’t Panic!”. When lost in Vim or things are going wrong, mash ESC until you’re back in Command Mode. When a file gets messed up because you’re unfamiliar with Vim, type ESC followed by :q! This will quit the file without saving changes (forced quit). If the changes are important, enter command mode with ESC and type :wq to write the changes to disk. When you’re ready to type into the text file, type i to enter insert mode. At this point, typing will proceed as normal until you hit escape to leave insert mode. You’re now as accomplished as I was for my first year of dabbling with Vim! I didn’t realize how little of Vim I knew until I saw the surgeon’s precision with which Gary Bernhardt wielded Vim. As soon as I saw this I wanted more. I took his advice and started paying attention to the language of Vim, which largely consists of unmodified alphabet keys and shifted alphabet keys. Learning some of these has made my typing DRASTICALLY more efficient. I now feel very little resistance when typing. It’s as if my thoughts are able to leap onto the screen without obstacles. It’s magic folks! And you too can cast these spells with enough time and effort. But mastering Vim (or at least becoming proficient) is a longer topic than I can cover in this post. So let’s move on to discuss plugins and the .vimrc. Let’s get this out of the way: Vim’s not terribly friendly with the default configuration! So what’s the solution? .vimrc and Vim plugins. Plugins are re-usable Vim code that has grown too large to be included in the Vimrc. Plugins extend the functionality of Vim and can make it act more like an IDE. 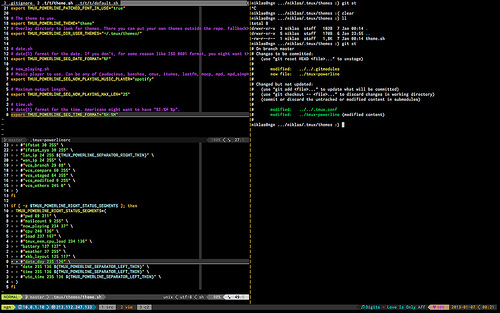 There’s currently a vibrant community of Vim users and a growing number of Vim plugins. Hope this helps get someone started in Vim. It’s a very rewarding and sometimes frustrating journey.